I’ve tried many things to reduce overall inflammation from determining my food sensitivities to these supplements turmeric and milk thistle (definitely worth giving a shot if you struggle with inflammation). They all made a difference in lowering my CRP but it still remained chronically high every time it was tested. What’s up? Well you see I had a root canal, yes you guessed it on the bottom left side, about 20 years ago and this thermography made so much sense. Root canals are known to harbor bacteria, deadly bacteria even that can cause disease. Stay tuned for more on this as I will be writing about advanced steps that I’ve taken to regain my thyroid health. But first here I invited the woman who ran my thermography to share the benefits, and boy has it been a surprising experience for me. Thermography is also known as Digital Infrared Thermal Imaging. Thermographic scanners measure the infrared waves (heat) emitted by your body and translate it into thermal images. Thermography detects areas of localized, increased temperature, which usually correlates with inflammation or tissue abnormalities. Those areas can be viewed as “hot spots” of existing or potential problems. To put it simply, if an area of your body starts to get “hot”, it’s going to do so at a very early stage in the disease or injury process. This gives you an early warning and head-start to further investigate changes in your body and eliminate the sources of inflammation. Since there is a high degree of thermal symmetry in the normal body, subtle abnormal temperature asymmetries can be easily identified. In healthy people there is a symmetrical thermal pattern that is consistent and reproducible for that individual. Thermography measures temperature and compares symmetry or asymmetry as it pertains to the right and left side of the body. Injury or disease will result in thermal asymmetries. You may be wondering why you have never heard of thermography. Thermography has a long history. Breast thermography was discovered in 1956 in Montreal, Canada and rapidly became popular throughout the world. It was FDA cleared and then certified by the American Medical Association as an adjunctive screening procedure for breast cancer in 1982. Recent advancements in technology have allowed us to perform even more accurate exams. A 2008 study published in The American Journal of Surgery, performed at New York Presbyterian Hospital Cornell, showed a 97% sensitivity in discriminating breast cancer compared to biopsy. Although medical thermography has been around for several decades, it has not received the attention and credit it deserves from the medical establishment. However, more and more patients are becoming aware of this amazing technology – with no radiation, no pain, and no body contact – and it’s not unusual that the patient is the one who ends up informing their physician about thermography. Women deserve earlier detection for breast cancer, and this is it. Absolutely not. The information gained from a thermogram is valuable to men and women, of all ages. Thermography can be used to detect health conditions from cancers, back and neck pain, injuries and fractures, neuropathy, hormonal imbalances, arthritis, dental problems, carpal tunnel syndrome, heart disease, digestive disorders, infections and more. In addition to an optimal diet, keeping the bodys flow systems functioning is the key to reducing inflammation and disease in our bodys ecosystem. If our flow systems are stagnant, we will be holding on to “pond” water – microbial and metabolic waste overgrowth. Movement will keep our systems flowing and breakdown all of our body’s chemical reactions whether it be nutrients, hormones, microbes, or metabolic wastes (just to name a few). The terrain of our body requires motion and flow- just like the ecosystem of our earth. Stagnation equals overgrowth of pond water which equals inflammation which equals the onset of disease. 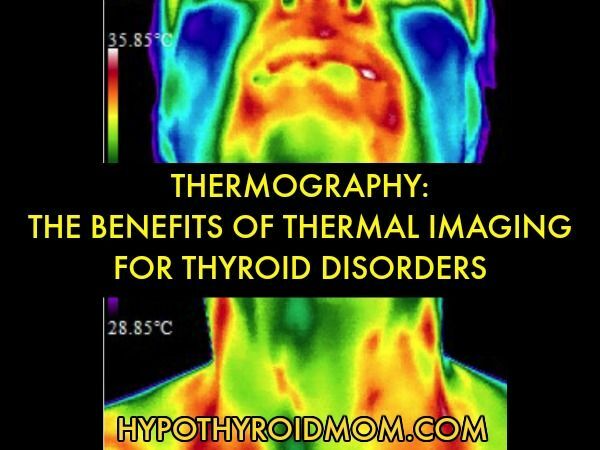 What does thermography have to do with your thyroid? Many times thyroid issues will link back to poor digestion based on the chemistry of HCL (stomach acid) and digestive enzymes. Another consideration, which is rarely mentioned, is blockage or slow moving flow systems due to muscular spasms/tension patterns in the head, neck, and shoulders. Muscular tension is pressure that can slow down lymphatic flow, circulation, and nerve messaging. All of which are important and necessary for the thyroid and everything else in the head and neck and below. Many times Thermography will show an enlarged thyroid or nodules before any blood test will have hormonal markers. So often one body part is targeted as an issue when actually, assessing the flow systems is the best way to open the entire body up for cleansing, support, and healing. Lymphatic flow drains our toxins and wastes. Blood carries our nutrients and oxygen to the area as nerve flow sends messages. Imagine if your thyroid didn’t quite get the message from the nervous system to help it function optimally. It’s like a cellphone getting poor service. Keeping the head, neck, shoulders relaxed and moving is important as tension patterns will cause more than a tight feeling in your neck. Thermography as an assessment tool has been very rewarding for me personally and for my patients. As an advocate for self-care I am always very pleased to see the differences in the thermal imaging reports once the baseline is completed. It has proven that taking the time to care for yourself is a major benefit for overall health. This is one of the major benefits of thermography- seeing the inflammatory pathways and the response your body has to self-care. Here are some simple tips to restore the flow within the head, neck, and shoulders that can benefit the thyroid gland. Tammy Kohlschmidt is a Certified Clinical Thermographer at Thermography for Healthy New York and a frontrunner as a Licensed Dental Hygienist. She has a special interest in the Oral Systemic Link and in Non-Surgical Periodontal Therapy using Lasers. By combining Thermal Imaging and Periodontal Therapy she has made connections between the mouth and body that address The Oral Systemic Link. Tammy believes the mouth and body share an ecosystem that must be treated as a whole to obtain sustainable health. Is an Endocarditis the best way to go? Hi Dana, this is a great article. I’ve been interested in thermography for a while but haven’t gotten to doing my reading on it yet. Was this a whole body test? Was it covered by your insurance and if not how much was it? I too would like to know about the same test and cost.